Whether you’re on a building site, driving a truck, operating machinery or working on farm, there is the potential for accidental powerline contact. Our Powerline Safety Planning Tool is an interactive map that displays powerline locations and can help you plan ahead and take appropriate actions to safely work around powerlines. Plus, you can request safety advice, organise de-energisiation or relocation of powerlines, the application of powerline markers and access relevant safety information. For the safety of you and your workers, you need to maintain a safe distance from powerlines while you are working; this is what we call an exclusion zone. There are three different zones: 3 meters, 6 meters and 8 meters, depending on the voltage of the powerlines. An exclusion zone of 3 meters applies to most of our network. If work could breach these distances, you will need to contact us as soon as possible before work begins. By completing a request for Safety Advice, we will help you to apply the appropriate control measures to eliminate or reduce the electrical safety risks on your site and maintain a safe working environment around our network. Request a Safety Advice. Complete an online Safety Advice Request Form if you are working near our electricity network. Reviewed within 5 business days. Your request for Safety Advice is received and assessed by us within 5 business days. You may be contacted for further information. On-site appointment. We will contact you to arrange an on-site appointment to discuss your specific needs while meeting the Code of Practice and Electricity Entity Requirements of Working Near Overhead and Underground Electric Lines (PDF 1015.1 kb). Safety Advice issued. Safety Advice will be issued to you with agreed control measures that follow the Code of Practice - Working Near Overhead and Underground Electric Lines 2010 (Control the Risks, Section 2.3) (relocation, isolation or flags). If the scope of work alters from the initial discussions on site with a our representative, you will need to contact your assigned Energex representative as soon as possible. This is to review the new scope of works and required control measures, and in some cases a new Safety Advice may be issued. Any Person Conducting a Business or Undertaking (PCBU) at a workplace must comply with the requirements of Electrical Safety Regulation 2013 Part 5 - Overhead and Underground Electric Lines and Electrical Safety Code of Practice 2010 - Working Near Overhead and Underground Electric Lines to ensure that no person, plant or item of equipment comes within an unsafe distance (exclusion zone) of an overhead powerline. Compliance with these regulatory requirements is essential to reduce the risk of electric shock and contact with powerlines and other assets which can have deadly consequences. 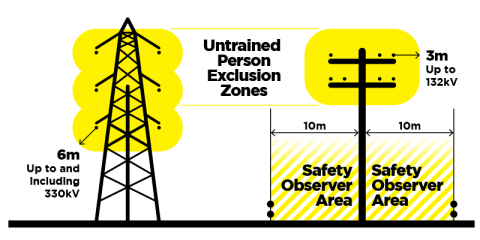 An exclusion zone is a safety area around an overhead powerline. No part of a worker, operating plant or vehicle should enter an exclusion zone while the overhead powerline is live. Exclusion zones keep people, operating plant and vehicles a safe distance from live overhead powerlines. adhering to any requirements of an Electricity Entity responsible for the line. The exclusion zones are set out in the Electrical Safety Act 2002 (Qld) and Electrical Safety Regulations 2013 (Qld). You can also obtain this information in the Electrical Safety Code of Practice - Working Near Overhead and Underground Electric Lines 2010. For more information on request for Safety Advice, read our Frequently Asked Questions.